What's For Dinner Tonight Love? A daily question B and I pose to each other. B & I are always on the lookout for new eating places. When we first moved here, we were pretty excited to check out all the new restaurants mushrooming in our area. But now, after a year of living here, we're running out of places to eat. You’re probably wondering why we're constantly searching for places to eat when there's a well-equipped kitchen and a reasonably good cook in the house, but let’s save that thought for another day shall we? In our quest to find the best restaurants to dine in, we sometimes win and we sometimes lose. The last time I tried to be adventurous by picking a recently opened restaurant that really looked inviting from the outside, we ended up spending RM50 on a miserable dinner of extremely salty fried rice, watermelon juice that had more water than watermelon and teeny-weeny mushrooms disguised as some sort of appetizer! Never again will we patronize that restaurant! Anyway, in view of all my dining experiences – the good and the bad – I’d like to answer Mike’s meme on 5 great places to eat, which are local to me. Thanks for this meme Mike! Fatty Crab, Taman Megah – A favourite amongst the locals and foreigners alike, this restaurant definitely gets 2 thumbs up from me! It's famous for its delicious chilli crabs served with toasted bread. When dining here, we usually have the crabs, yummy garlic prawns and Chinese fried rice, which to me is the best one in town. Top it off with a glass of cold Chinese tea and you’ll have a meal set for a King! D’Tandoor, Damansara – This restaurant serves authentic Northern Indian curries and Tandoori cuisine. Once you’re seated, your waiter will arrive with a plate of papadam served with tasty green chilli dip. My favourite dish here is the seafood biryani, which is absolutely divine. D’Tandoor also serves some of the best Indian desserts like Gulab Jamun (picture above), which is ultra sweet so even one is sufficient to satisfy my sweet tooth. Gulab jamun - A popular Northern Indian and Pakistani dessert, made of a dough consisting mainly of milk solids, in a sugar syrup flavored with cardamom seeds and rosewater or saffron. 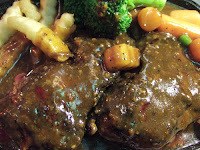 Steven’s Corner, Uptown Damansara is the first place that comes to mind whenever I get a sudden urge to devour black pepper steak! Seeing that this is more of a stall rather than a restaurant, Steven’s serves reasonably priced Western food. The best part about their steak is the thick black pepper sauce that comes with it - spicy and very tasty! FAM Char Kway Teow, Kelana Jaya – I was first introduced to this place by a friend years ago and now, it's one of our favourite choices for Sunday brunch. This stall is managed by two lovely aunties, who dish out the best tasting kway teow ever! 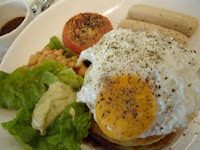 I usually have my kway teow (small extra spicy) with a nice tall glass of Nescafe Ice. 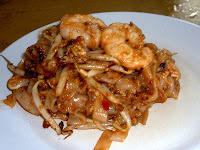 Char kway teow is a popular noodle dish in Malaysia and Singapore. It is made from flat rice noodles, fried over very high heat with light and dark soy sauce, chili, prawns, cockles, egg, bean sprouts and Chinese chives. Paddington House Of Pancakes, The Curve - This is the best pancake house I've come across, with more than 100 types of pancakes from all over the world served including pannekoeks, galettes, American stacks, poffertjes, blitzes, blinis and so on. The best part about this restaurant is that it serves both savoury and sweet pancakes. Savoury pancakes might sound a tad weird and I was initially skeptical to try out their savoury Full Monty but now it's actually my favourite choice on the menu! The brown gravy that goes with this is absolutely divine! Okay, that was fun! According to the rules of this meme, I'm to list others who have done this list and tag some other friends for this meme, before listing my own name (see below). Here are my picks for this yummy meme: Adrian, Emila, Janice, Jean, Bobby & Barrett. Ok Jean Jr. Now I'm in the mood for something unavailable here. Guess I'll settle for a hamburger, though I would really like to try those pancakes!! Thanks for the tag. This may take me sometime to do.... LOL. Bobby you heard that? Adrian wants to play host to you when u come down to our food haven LOL!! Actually, in Sg... there are quite a few places with good char kuay teow too. The more I look at your dishes, my stomach is making all those noises. CGirl!! They do look yummy don't they? Lunch time there? It's dinner time here! Loads of love and HUGS from Phoebe and me! Everyone that comes here always gets lots of love:)That's why I come here plus to give you comment love:) Good morning Phoebe! Where's the breakfast menu? PS. Bobby, I'll be coming by later to give u some comment love too :)... this msg is from ME and not Phoebe btw! I'm seriously gonna try out the pancake place you mentioned as I've still not found a place that serves good ones here in KL thus far. Hey Mariuca. I have tagged you in my post about "8 Facts about yourself." I added your url to my viral tags to build the powerful effectiveness of viral networking! Would you please add me viral tags. Thank you! Meow Jesse! I hope u do get to taste them one day, this is just a glimpse of the delicious food haven awaiting u here in Malaysia! Seriously abt the restaurants there? Good thing I didn't tag u on this meme then LOL! :) Always good to see u here, HUGS! I'm new here landed up searching blogs on resources on pets. cool blog you have here, keep it up. i'm also interested in dogs and do have a german shepherd named devil ( named after the phantom's dog - i was a huge phantom fan in my childhood ) any way its nice to be here. i'll be back some time later for more updates. on dogs in our blog interesting. do leave comments there. see ya. Hi Jesse! Oh, we have some bad restaurants here too, but there are plenty of excellent ones as well, which is another reason we go in search of new interesting places to eat. I will definitely check out the article u mentioned, and perhaps see some on cats too? Have a great Saturday! Those sound yummy! I am a total foodie! I love the Bravo show top chef and I love trying local foods when I travel! It is fun to be adventurous, sometimes you find great munchies at a bargain! How are things Marzie? Hi Barrett! So nice to see u here again. Hope u are doin well there. Hey there, I am SO excited about this post! I have tried three resteraunts over the weekend! I will be posting soon! how are things? I luv the Crabs, Fried Rice and Chicken WIngs at Fatty Crabs too. Am glad to see another FAM kuey teow fan, it's so delicious. I have yet to try the curry laksa though cause every time I go there, it'll be my standard kuey teow order :):):) Maybe next time I'll try something else! Every thing looks so yummmmy!!!! This food looks really good! Oh my goodness. Now you have me craving this the first thing in the morning. 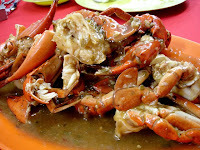 I agree Fatty Crab at Taman Megah certainly has one of the best crabs around!!! And my Steven’s Corner seriously expanded quite far since the last time I went there..and I agree too Paddington House of Pancakes is yummylicious! yeah, been to 4 of the places u mentioned up there, except for D'Tandoor. As for steven's corner, i have been to their first stall which is still at OUG. do u know why our m'sian footballers cldn't perform in their matches? its bcuz of that chow kway teow stall where they sneak out to curi makan. Wah... I'm hungry and I had just my sahur.. eh taman megah tu kat ner.. macam pernah dengar jer.. looks good lah the crab! great review! nanti nak pi jalan2 cari makan! 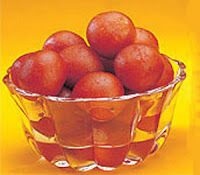 marzie, nak try gak gulab jamun tu..sedap tak? bobby, i prefer chicken burger. nick, i sometimes go to steven's cornet...love the fried sotong! butseriously i digg peria goreng! yummee bebeh! I sangat suka seafood and that crab dish looks very inviting lah! ish ish ish.. buat i lapar lah!!! oh debbie, dah meleleh air liur dah ni!!! must go and cari kuey teow kerang today! Hmmm..dekat dgn tempat I ada satu gerai yg jual char kway teow yg sedapsss! :):) Dah lama tak pekena! telur dengan coarse black pepper tu pun nampak yummy! Lada hitam murah kat Sarawak. Kalau nak, bleh kirim! :) Bulan 12 I balik Sarawak lagi, yay!! debbie, nak! nak! nanti belikan saya ya! I nak yang coarse! Nanti let me know what's the price and I'll bank in to your acc. ehhh the last time u makan there was like 3 years ago ah?? *DONT_KNOW* *DONT_KNOW* *DONT_KNOW* hahaha so when r u goin g there again? Huhuhu dat time didn’t know u yet Monica! Hahahha!!! LOL otherwise sure tag u one, food meme summore.. ur fave! LOL! No la not 3 yrs ago, last yr oso went! Hahah!